JoAnna Ferrari visited Medibank to share her inspiring story of transformation. 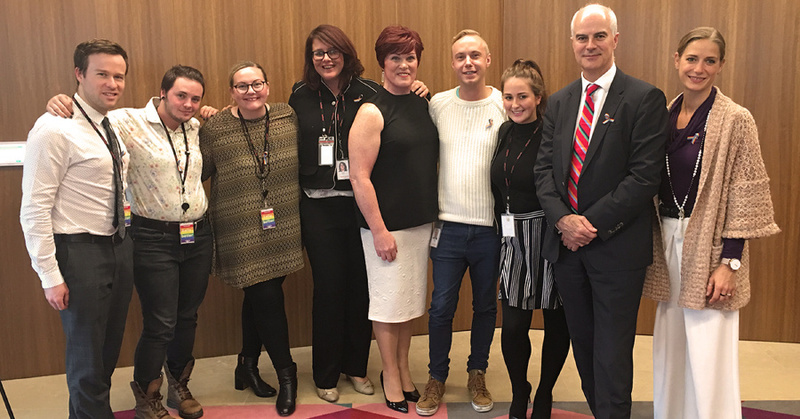 May 17 was International Day Against Homophobia and Transphobia (IDAHAT) and to recognise this important day, Medibank invited guest speaker, JoAnna Ferrari to their Melbourne office to share her experiences as a transgender woman. Medibank is a workplace that actively supports diversity and inclusion. Medibank has been an official partner of the Sydney Gay and Lesbian Mardi Gras since 2016 and is proud of their reputation as being a workplace where employees feel confident to bring their true selves to work. This all-inclusive environment extends to Medibank members – more than just a private health insurer, Medibank aims to be a partner in better health for every kind of individual, partnership and family. Speaking to a packed room, JoAnna had the audience captivated as she began to speak about her own, deeply personal experiences. But inside, JoAnna felt that John was not who she was meant to be. She talked to the audience about the difference between the ‘learned self’, shaped by what the world dictates to us, and the ‘secret self’ which in its simplest terms is being true to who you really are. And this has been JoAnna’s journey, so much more than the label of transgender. But as time passed and upon seeing how happy JoAnna was to be finally living life as her true self, her ex-wife and children have come back to her and many of her friends. At the end of the day, JoAnna’s main message was about self-love and what an amazing world it would be if we could all bring our secret selves into it. And that’s a difficult message to argue with. If you’d like to hear more of JoAnna’s story, check out her TEDxMelbourne talk, Your Secret Self.